"I love what you write. I think you're brilliant. You're wise. I needed to hear this today. You're a fantastic writer." It's easy to receive all these praises of men and claim it as my own. But then I want you to know that I don't because I'm the humblest person alive today. Kidding! Isn't it awkward to claim something like that? Seriously though, how easy is it to claim all the glory when people like you and like what you do? Of course we're allowed to feel good and receive compliments. But I think the problem comes in when instead of pointing to the direction of the Source, we tell the world that we did it all by ourselves. George Burton Adams said: There is no such thing as a 'self-made' man. We are made up of thousands of others. Everyone who has ever done a kind deed for us, or spoken one word of encouragement to us, has entered into the make-up of our character and of our thoughts, as well as our success. Now, that's something that puts things into perspective. We may have made 90% of the effort; blood, sweat and tears, but we owe at least 10% to other people. to the stranger who showed us a random act of kindness...or rudeness! There's no point in bragging about our achievement because we couldn't have made it on our own. Don't get me wrong. When people tell me I look beautiful, I'm smart, I'm good at something, or they like me, I blush, I feel flattered, I receive it. I bask in it. Hey, it's a blessing! Not everyone gets that compliment. But I consider it as God affirming me and like a boss telling me, "Good job! Keep up the good work." Or a Father who lovingly looks at me and say, "Of course you're beautiful. You're my daughter. I'm proud of you." I let myself receive all these love and kind words. (Even the criticisms that I know will help make me grow and improve). But at the end of the day, I know and I believe that it's all because of Him and for Him. That without His grace and mercy, I wouldn't even be here typing this reflection. 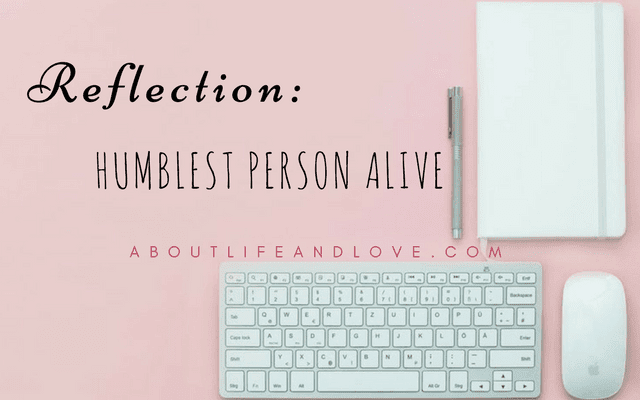 Humblest person alive? I know one. A good friend of mine. In fact, I think most of my friends and mentors are humble beings. That's why I want to emulate them. But the humblest person alive in my opinion is Someone Who gave up His majesty, His throne and His glory and took the form of a lowly mortal. He who ate, drank, perspired, walked the muddy and sometimes dusty road on Earth to be with His servants. Lived with them, talked to them, and loved them with all that He is. Took their place at the cross. Someone who traded His royal crown for the crown of thorns to show His big love. That is one King worthy of praise. That's the real humblest person alive. Beautifully written. Amen to the Humblest Person and that is our Lord and Saviour! Have a beautiful new week! Bragging seemingly has become the culture of social media. Beats met. It takes a village, right? No one is truly self-made! Best to be humble. It is a good attitude to being happy. An amazing post as always. I totally agree with you. You made me think about. You have such a lovely writing style Lux! Here's to the humblest person and your beautiful writing! This is great and true on so many levels. We are all connected in more ways than one. Your post is full of thoughtfulness, certainly it is a subject worthy of it. So very true. Support definitely plays a large part in success. At least, it helps those reach success far quicker than without. Hello what a thoughtful post. Well said and I love the first quote. Happy Monday, enjoy your new week! Humility is a good quality to have. I think what helps to ground me in humility is that everything I have, I owe to God. So well said and yes, beautifully written! Thanks Lux for sharing at Faith 'n Friends Link Party! I so appreciate you! This was very insightful. So many have had a hand in making us who we are. Hopefully, for those of us who are Believers, God has made the most impact. May you clearly hear Holy Spirit speak to you and feel the love of Jesus. Oh Lux, it has been awhile. I'll be over in a few minutes for a visit. The chemo went well today. Now to recover! Here's the response to your comment on my blog, in case you didn't see it. I am with you ... we owe it all to God! That He could sacrifice so much - that He could love me so much in spite of my shortcomings - and that in me and through me He chooses to do work that He could easily do without me - I am in awe of Him. I always love my time here, my friend ♥ Your words inspire me. Thank you so much for sharing HOPE at #MomentsofHope!